What is a Diagnostic Arthroscopy? Diagnostic arthroscopy is a key-hole surgical procedure that allows your orthopaedic surgeon to look inside of a joint in your body through a camera called an arthroscope. Diagnostic arthroscopy lets your orthopaedic surgeon look at the surrounding soft tissues, joint surfaces, ligaments and cartilage. Diagnostic arthroscopy can be used to find out the joint problem and at the same time, repairs any soft tissues’ damage or remove any loose bodies. Diagnostic arthroscopy is most common perform on joints such as knee, shoulder and ankle. It can also be done on the hip, elbow and wrist. During arthroscopy, the arthroscope is inserted into your joint through key-hole size cut in the skin. The arthroscope has a light source and a video camera attached to it. 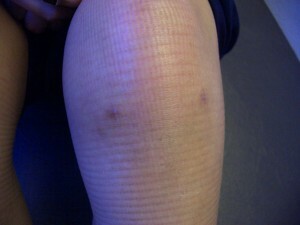 Images from the camera is sent to a video monitor and the magnified images can provide a clear picture of your joint. If you are doing a biosy, a sample of the joint tissue can be removed during arthroscopy for biopsy. If there is repair to be done, additional instruments will be inserted into your joint through the same incisions. Diagnostic arthroscopy allows your orthopaedic surgeon to physically see what is the problem in your joint when physical examination and other diagnostic investigations such as X-rays, MRI or CT Scans are not conclusive. Can be done as a day surgery without staying overnight in a hospital. Why Diagnostic Arthroscopy is Done? Evaluate and diagnose your joint problem when physical examination and other diagnostic investigations such as X-rays and MRI are not conclusive. Should the problem is found during the arthroscopy, repairing can be done at the same time. Bone tissue can be shaved to remove calcium deposits or bone spurs. Ligaments, tendons or cartilage can be repaired or trimmed. Ligaments can be repaired and reconstructed. Releasing a tight ligament may allow increased range of motion for a stiff joint. Samples of joint tissue or joint fluid (synovial fluid) may be collected for biopsy investigation. 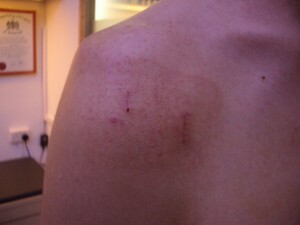 Inflammed scar tissue or joint lining (synovium) can be removed. Diagnostic arthroscopy is done by an orthopaedic surgeon. Diagnostic arthroscopy is usually done under general anaesthsia. A small incision about 0.6cm will be made to your joint. Once the arthroscope in inserted, your orthopaedic surgeon will be able to see the inside of your joint by the video monitor which captures the images sent from the arthroscope. The wound will be closed by dissolvable stitches. Depending on the joint which the arthroscopy is done, you may need to splints, slings or crutches. The duration of the arthroscopy depends on what is done. It may take about 15 minutes or an hour. Diagnostic arthroscoy is a procedure which allows your orthopaedic surgeon to see inside your joint. Your orthopaedic surgeon can determine whether your joint is normal through this procedure. Normal: In a normal and healthy joint, the ligaments look like white cables. The cartilage is smooth and white almost like porcelain. The joint fluid is clear, and there are no loose bodies in the joint. Torn ligaments, soft tissues and cartilage damage. Abnormal growths such as cysts or ganglions. Joint or cartilage damage caused by arthritis. Arthroscopy usually requires a day stay in the hospital and faster recovery compare to open surgery. Let our orthopaedic surgeon advise you on how diagnostic arthroscopy can help you today. Call +65 64712674 (24hr) for an appointment.